I use a lot of different brushes in my daily makeup routine. Even though it can seem complicated, it makes applying various products so much easier when you use the right brush. 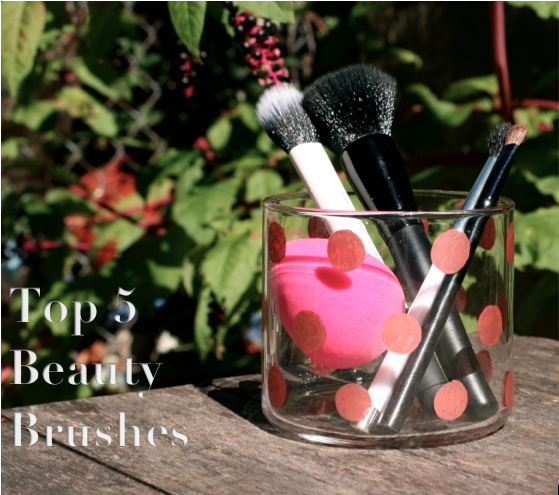 This was very difficult to do, but I limited myself to choosing only five of my favourite beauty tools to share with you today. The next two brushes are eyeshadow brushes. I know this might sound crazy...but I use between 5-6 different eyeshadow brushes when doing my makeup. In my defense, you need the lid colour, the crease, blending, eyeliner, inner-corner highlights....it goes on and on! Two that I use every day are this shader brush from Target and this Sonia Kashuk fluffy blending brush, also from Target. I love Target's line of brushes; they are really affordable and good quality. I own two of this shader brush, and I have had them for years. I also love the Sonia Kashuk line of brushes, again very reasonably priced and easily accessible. I use this brush for applying a transitional crease shade and to blend out shadows. It was difficult to pick only one Real Techniques brush, but I have to say the Real Techniques Duo-Fiber Contour Brush is my favourite. I love wearing highlighter, and this brush applies any highlighting product perfectly. You get the perfect glow without looking overly sparkly or shimmery. Some runners up are the Contour and Buffing brushes from the Core collection. Finally, another bargain, the elf Studio Powder Brush is a great brush for applying an all-over face powder. I use it for setting my make-up with translucent powder, but I have heard it works for applying liquid foundations as well. For three dollars, it's a steal. This list is definitely not exclusive! But I thought I would share some great brushes that are all pretty affordable. They are also all brands in which I own several other types of brushes from. If you are looking for a new beauty tool, I highly recommend checking these brands and specific brushes out! What are your favourite make-up brushes and tools?